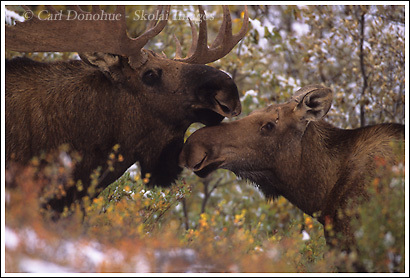 Photos of Denali National Park, Mt. 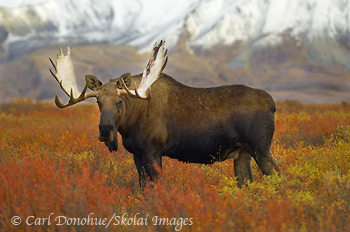 McKinley, tundra, mountains, wildlife, birds and more from Denali National Park, Alaska. This entry was posted in Adventures, Alaska, Denali National Park and tagged Denali National Park and Preserve, Landscapes, scenics, Winter on January 14, 2012 by Carl D.
This entry was posted in Alaska, Denali National Park, Landscapes, Photos Only on November 30, 2011 by Carl D.
Denali, Mt. McKinley, Denali National Park and Preserve, Alaska. 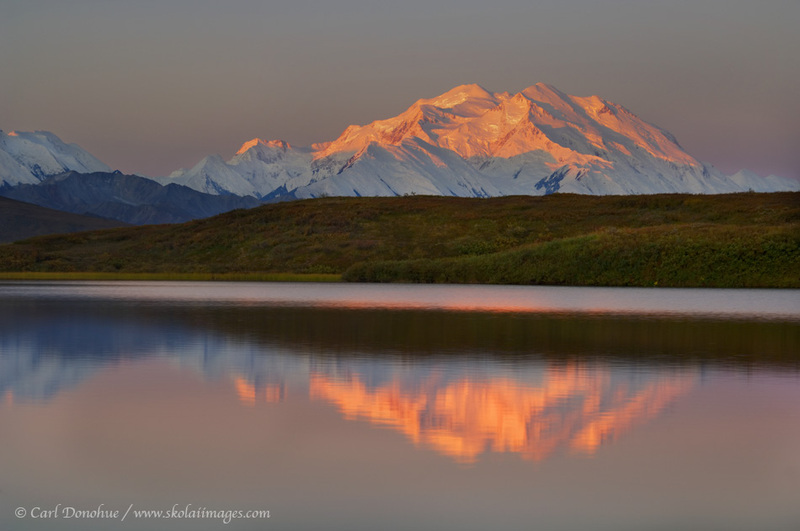 Early morning photo of Denali, Or Mt. 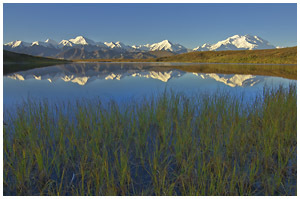 McKinley, and reflection in a small tundra pond, Denali National Park, Alaska. Click on the thumbnail for a larger image. A few years ago I spent a glorious week in Denali National Park and Preserve, camped out in the backcountry at one of my favorite spots to hang – a high ridge to the north of Denali, or Mt. McKinley as it’s officially known (see this post for a discussion concerning the name of the mountain). After too many years and way too many footsteps across the tundra, I finally happened to be in the right place at the right time. Previous trips had me wet, cold, hungry, and wondering where this infamous mountain actually was (hidden, veiled behind the infernal clouds). This one was gloriously different. This entry was posted in Adventures, Alaska, Backpacking and Hiking, Denali National Park, Landscapes, Travel and tagged Denali National Park, Denali National Park and Preserve, Fall, Landscapes, Mount McKinley, Mountains, Mt. McKinley, ponds, reflections, scenics on November 18, 2009 by Carl D.
A dall sheep ram approaches while it grazes on the high alpine tundra, Denali National Park and Preserve, Alaska. Here’s a Dall sheep ram I photographed a few years back, when I was doing a hike in Denali National Park and Preserve. It’s been a couple of years now since I spent any time in Denali National Park (the last time I was beyond Savage River was on a trip with my parents, in 07). 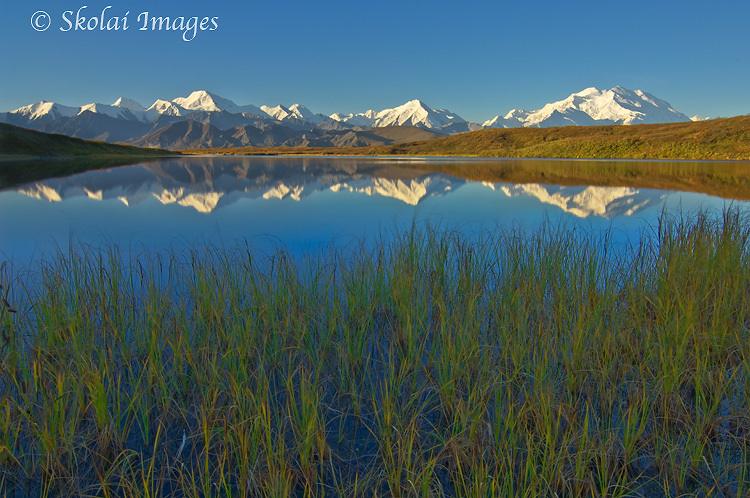 As much as I enjoy my project in Wrangell – St. Elias National Park and Preserve, I do miss photographing in Denali. 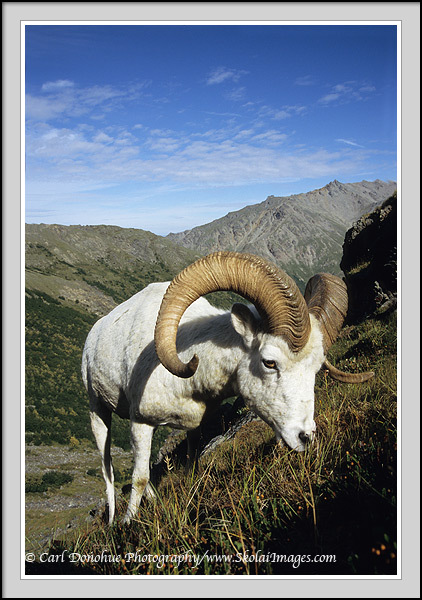 Hopefully this next year my schedule will work out such that I can squeeze in some time in Denali – and find this Dall sheep ram again. This entry was posted in Alaska, Denali National Park, Wildlife and tagged Denali National Park, Denali National Park and Preserve on November 6, 2009 by Carl D.
Bull and cow moose, Denali National Park, Alaska. 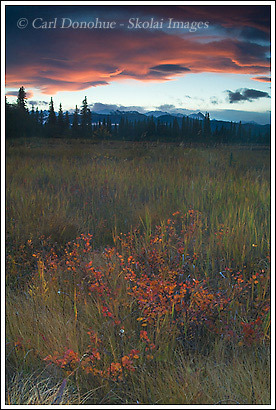 This entry was posted in Alaska, Cool stories, Denali National Park, Fall, Moose, Wildlife on October 12, 2008 by Carl D.
Sunset over the Alaska Range, Alaska. Here’s an old image I dug up last night .. going through some old files for editing. 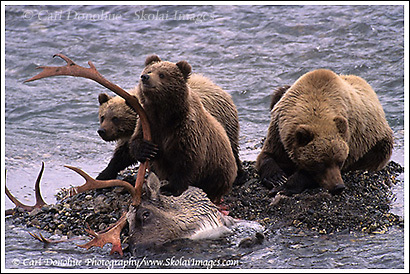 I shot it a couple of years ago, returning from a trip to Denali National Park one fall. The sky began to clear up late in the afternoon, and I was driving back towards Anchorage. A week or so in the park with clouds and rain and on my way home, a sunset! I pulled over to the side of the road, wandered off into the woods, got completely SOAKED in this marshy area, and set up my gear near this Dward Birch (Betula pumila or Betula borealis), glowing orange in late autumn colors, and the clouds began to catch the last of the day’s rays. Then i walked back to my truck, and got my feet even more wet. 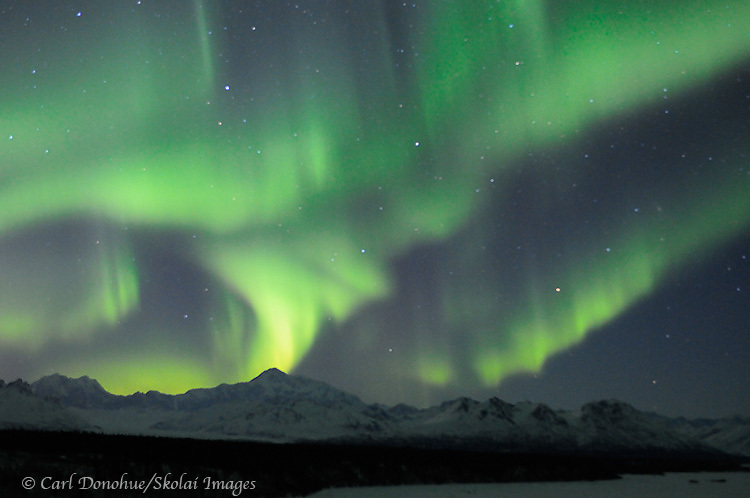 This entry was posted in Alaska, Denali National Park, Fall on October 4, 2008 by Carl D.